St. Thomas native Logan Michelle William’s love affair with coral began when she was two years old, snorkeling the waters of St. Thomas with her father. That passion didn’t quite crystallize until she took a marine biology class as a senior at Antilles School. The class took her back to the waters over the reefs of her childhood, right after the 2005 bleaching event that wiped out up to 90 percent of coral in some areas of the island. Now, Williams finds herself at the tip of the spear in the territory’s race to save its devastated coral reefs, with tremendous support from Coral World, the University of the Virgin Islands and the Nature Conservancy. Her technique of choice? Micro-fragmentation. Micro-fragmentation, a fairly recent development in the field of coral restoration, was discovered somewhat accidentally by marine scientist David Vaughan of the Mote Aquarium in Sarasota, Florida. The technique requires cutting up coral into very small pieces, each with just a few polyps, and allowing those pieces to grow. For reasons yet scientifically uncertain, the smaller coral pieces grow at a rate exponentially faster than their larger counterparts. “Some ideas have been put forth. Maybe when they’re that small, that’s the most vulnerable part of their life. Instead of using a lot of their energy for reproduction, they use it all for growth. So growth is extremely exponential during that time,” Williams said. The process begins with collecting corals that are either already in Coral World’s facilities or what they call “fragments of opportunity,” corals that have been knocked off of their parent colony and ended up buried in the sand or in other environments where they would inevitably die. Williams then uses a wet tile saw to cut the coral into small pieces, then bone clippers to cut them even smaller – one cubic inch of coral can yield up to 60 micro-fragments. Coral micro-fragments grow in Logan Williams’ tank. The coral pieces are then quarantined placed in consecutive tanks of aerated water for a few days to make sure they do not have any disease or stress-related disorders. The pieces that pass quarantine are then attached to small tile mounts and placed in a larger tank, where they are left to grow and eventually transplanted to areas close to where they were harvested. With those corals in the final tank, Williams said she prefers waiting a year before transplanting them out to the reefs to eliminate the possibility of diseases or other issues that may infect other coral. “Ideally, what I would like to do is just keep cutting them into smaller pieces, so you increase your stock, so when we do get to that level of transplantation, we’ll have hundreds of fragments that we’ll be able to transplant at that point,” Williams said. While Williams’ work is by no means the only coral restoration effort in the territory (some residents are planting coral “trees” underwater using easier-to-grow branching coral), Williams and Coral World are the only ones performing land-based efforts on what could be the last remaining major reef-building coral in the region. According to Williams, this type of coral, orbicella annularis, forms massive colonies over thousands of years, providing habitat for fish and invertebrates and protecting shorelines. “They’re the beautiful corals snorkelers see but unfortunately, they’re the most susceptible to all diseases and bleaching,” said Williams, who specialized in studying coral disease during her post-graduate work. Williams’ fledgling setup at Coral World may very well represent the territory’s biggest hope to restore its decimated reefs. The controlled environment will allow her to identify specific disease-resistant genotypes that can form the basis of stronger coral species. “In the future we can cross those to kind of create supercorals that will probably withstand the test of time,” she said. 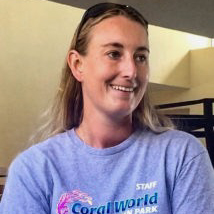 Williams said that with Coral World’s continued support, she plans to expand the system to “create hundreds or thousands in the future, and then millions maybe in the next 10 years.” And while the future of coral around the island looks grim, Williams’ said success stories such as those of Vaughan and the Mote Aquarium’s, and the techniques she witnessed in Punta Cana, in the Dominican Republic, are giving her hope.